Description: Prostrate shrub with slender trailing stems to 30 cm long arising from woody stolons; plants stellate-hairy in all parts. Leaves ovate to narrowly ovate, often oblique, 2–5 cm long, 15–25 mm wide, apex obtuse, margin irregularly crenate or lobed; upper surface green and sprinkled with stellate hairs, lower surface densely white-tomentose; petiole mostly 6–10 mm long. 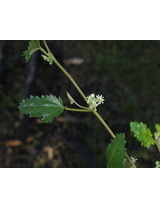 Inflorescences cymes few-flowered, shorter than petioles. Calyx c. 2 mm long. Petals c. 2 mm long, pinkish. Capsule c. 6–8 mm diam., stellate hairs on bristles dense, long; fruits summer-autumn. Distribution and occurrence: In sandy sites mainly confined to the Dubbo;-Mendooran;-and Gilgandra region, also in Pilliga and Nymagee areas; rare. 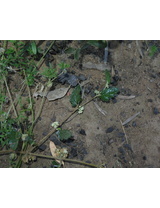 This species has been transferred to the genus Androcalva by Wilkins & Whitlock (2011). 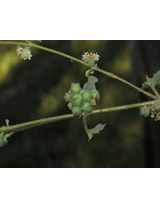 However, it is here currently maintained in the genus Commersonia until its taxonomic status is fully evaluated.